Where each dinner is prepared at your Teppanyaki Table in the finest of Japanese tradition, by your Chef. Your dinner includes: Japanese clear soup, Hibachi shrimp appetizer, Japanese Salad with our home made Ginger Dressing, Japanese Tea, Fresh oriental vegetables, Steamed white rice, or upgrade to our famous Japanese fried rice. It is a small intimate room with limited seating, reservations required. We accept parties of no less than 4 Adults and no larger than 8. Japanese Steakhouse settings are Friday and Saturday at 6pm only. Japanese Teppanyaki Dinners only available in the Japanese Steakhouse. beautiful farmers style porch offering dining and Tiki bar, set up with flamed deck heaters to help take the chill out of the night air, a roof to help protect from the sun or the rain and mosquito magnets to help keep those pesky mosquitoes at bay. And Acoustic Style Entertainment to add a little summer fun. There is also a fire pit, horse shoes and corn hole for everyone to enjoy. 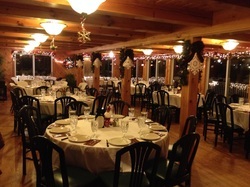 Functions & Banquets: We offer a variety of banquet services. We offer something to fit every budget & occasion. Holiday parties, wedding rehearsals, class reunions, employee appreciation, family gatherings, business meetings, whatever the occasion...from small to large, let us help plan your special event. ​or eggs may increase your risk of food borne illness. Loaded Nachos $14.99, Corn tortilla chips piled high with chili, melted cheese, diced tomatoes & green onions, served with salsa & sour cream. Bacon Wrapped Scallops $14.99, Fresh sea scallops wrapped in applewood smoked bacon drizzled with real maple syrup. Teriyaki Steak Strips $14.99, Marinated in homemade teriyaki sauce & flamed-grilled. Pepper Calamari $11.99, Lightly breaded calamari tossed with banana peppers, served on marinara sauce & topped with a balsamic reduction. Home Made Crab Cakes $13.99, Homemade blue crab cakes, hand crafted & served with horseradish sauce. Seafood Stuffed Mushroom Caps $11.99, Stuffed with a Ritz cracker & seafood stuffing, topped with melted cheddar. Gyoza $6.99, Pan seared Japanese beef dumplings. Shumai $6.99, Steamed Japanese shrimp dumplings. Chicken Tenders $6.99, Golden deep fried all white chicken. Buffalo Tenders $7.99, Golden deep fried all white chicken tossed in buffalo sauce. Jalapeño’s Poppers $6.99, filled with spicy queso cheese. Fried Mozzarella $5.99, Lightly breaded, deep fried & served with marinara. Japanese Fried Rice $5.99, Vegetables, eggs & seasonings. Japanese Miso Soup $4.99, Soybean soup with tofu, scallions & seaweed. Japanese Clear Soup $4.99, Beef & vegetable consommé with scallions & mushrooms. Large Garden/Caesar $9.99…Add Flame Grilled Chicken Breast $4, Add Pan-Seared Shrimp $4, Add Grilled Salmon $8 or Add Flame Grilled Steak Tips $8. Steakhouse Sandwich $12.99, Tender pieces of Black Angus beef, cheese, lettuce, tomato, sautéed mushrooms & onions, served on a ciabatta roll, with French fries. Served on a ciabatta roll with French fries. topped with a mushroom bleu cheese sauce. Served on a ciabatta roll with French fries. Longhorn Wrap $11.99,Tender pieces of Black Angus beef, cheese, lettuce, sautéed mushrooms & onions, with French fries. Teriyaki Steak Wrap $11.99,Tender pieces of Black Angus beef, teriyaki sauce, white rice, lettuce, sautéed onions & peppers, with French fries. Bulgogi Wrap $13.99,Tender pieces of Black Angus beef,apple & pear teriyaki sauce, white rice, lettuce, cucumbers,onions & gochujang sauce, with French fries. Add a salad to any entree for $2. Substitute Japanese Fried Rice or Fettuccini Alfredo for $2. (GF) 16oz Black Angus Ribeye Steak $27.99, a delicious cut of marble steak cooked on our open flame grill, topped with roasted garlic butter. Served with 2 sides. Steak Oscar $29.99, 9oz Black Angus filet medallions, piled high with asparagus spears, fresh Maine lobster and béarnaise sauce. Served with 2 sides. Available as Salmon Oscar $25.99, Available as Chicken Oscar $22.99. Merlot Filet Mignon $24.99, 9oz Black Angus filet medallions grilled than topped with sauteed mushrooms & onions with Merlot demi-glace. Served with 2 sides. (GF) with no Merlot demi-glace. (GF) Mushroom Bleu Filet Mignon $24.99, 9oz Black Angus filet medallions grilled and topped with Mushroom Bleu cheese sauce. Served with 2 sides. Bulgogi $18.99, Ribeye steak marinated in a pear and apple teriyaki sauce, flame grilled then paired with our Japanese fried rice and broccoli. (GF) Jack Daniels Tips $19.99, Choice Black Angus beef tips grilled then topped with Jack Daniels honey barbeque sauce and caramelized onions. Served with 2 sides. Smothered Steak Tips $18.99, Choice Black Angus beef tips grilled then topped with brown gravy and sautéed mushrooms and onions. Served with 2 sides. Teriyaki Stir Fry $19.99, Choice Black Angus beef tips stir fired in our homemade teriyaki sauce served on steamed white rice with fresh broccoli. Available as Chicken $18.99. (GF) Bourbon Maple Grilled Pork $16.99, Bourbon marinated grilled pork topped with wood fire roasted caramelized apples. Served with 2 sides. and Maine lobster all baked in garlic butter and white wine with crispy parmesan panko crumbs. Served with 2 sides. Baked Stuffed Haddock $21.99, Fresh haddock fillet stuffed with homemade Ritz cracker seafood stuffing and baked with melted Vermont cheddar. Served with 2 sides. served over fresh baby greens and topped with Thai sweet chili sauce, diced tomatoes and scallions. Served with 2 sides. (GF) Grilled Salmon $19.99, Fresh Atlantic salmon fillet flamed grilled and topped with lemon rosemary sauce. Served with 2 sides. Tempura Fried Shrimp $19.99, Large shrimp dipped in Japanese tempura batter and deep fried. Served with 2 sides. (GF)Broiled Seafood, Your choice of haddock, salmon fillet or sea scallops, broiled in garlic butter and white wine sauce. Served with 2 sides. Seafood Alfredo $26.99,Fresh Maine lobster, large shrimp and sea scallops tossed with fettuccini and creamy alfredo sauce. Chicken Parmigiana $18.99,Hand breaded chicken breat deep fried and smothered with marinara sauce and mozzarella cheese served on a bed of linguini. Lobster Alfredo $25.99,Fettuccini tossed with creamy alfredo sauce, sweet fresh Maine lobster, mushrooms & spinach. Calamari Fra-Diavolo $18.99, Lightly breaded calamari served on linguini and spicy marinara sauce, topped with chopped green onions. Chicken & Broccoli Alfredo $18.99, Fresh broccoli florets tossed with a rich creamy alfredo sauce and fresh fettuccini, topped with flame-grilled chicken breast. Shrimp Scampi $18.99, A zesty, delicious, red pepper, garlic and white wine sauce over linguini, topped with sautéed shrimp, diced tomatoes and scallions. *Add fresh squash, mushrooms, spinach or broccoli. $1 per serving. **Add grilled chicken breast or large sautéed shrimp. $4 per serving. Brick Oven Pizza, Sized to serve one person, served with a Side Salad. Chicken Ranch $13.99, Grilled chicken, bacon, onion, tomato, garlic blend of cheese & ranch dressing. BBQ Chicken $13.99,Grilled chicken, onions, blend of cheese & BBQ sauce. Garden Harvest $13.99, Onions, mushrooms, broccoli, tomatoes, blend of cheese & Seasoned tomato sauce. of cheese & scampi sauce. Build Your Own Pizza. Cheese Pizza starts at $10.99. Mushrooms, onions, spinach, tomatoes, broccoli, garlic, sausage, pepperoni, chicken, shrimp or extra cheese. $1 each. We accept parties of no less than 4 Adults and no larger than 8. Japanese Steakhouse settings are Friday and Saturday at 6pm only. Your dinner includes: Japanese clear soup, Hibachi shrimp appetizer, Japanese Salad with our home made Ginger Dressing, Japanese Green Tea, Fresh oriental vegetables, Steamed white rice, or upgrade to our famous Japanese fried rice for $2. Children's dish includes: Steamed white rice, Fresh oriental vegetables and Ice Cream. 9% NH meals tax not included in above prices.